Schrorder Dairy – Schroder’s commitment to quality has resulted in the finest tasting milk. Quality to Schroeder means crafting milk that tastes the way it should-naturally sweet, soft and creamy. Superior flavor requires skill, commitment and technological expertise. Schroeder consistently delivers a better tasting product to our customers. Locally Souced from St. Paul, MN. Daisy– Sour Creams are 100% natural with no additives or preservatives. Daisy sour creams are made without fillers, preservatives, or stabilizers. The naturally cultured flavor ensures consistent taste for your recipes time after time. Daisy Regular Sour Cream, with its full-bodied, creamy texture and preferred taste, affords the greatest versatility for creative chefs. Bongard’s Cheese– Offers a variety of wholesome, premium chesses sourced responsibly as only a co-op could. 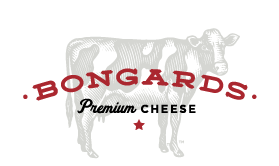 Bongard’s Cheese was founded in 1908 by farmers in Bongard, MN. Their goal was to craft premium dairy products and to offer superior quality that local families deserved. Each product is crafted from pure, premium ingredients — with quality assured by their co-op. Locally Sourced from Bongard, MN.